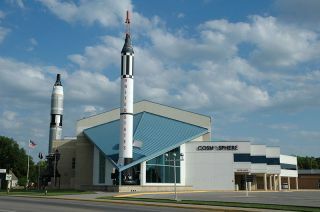 The Kansas Cosmosphere and Space Center in Hutchinson, Kansas, as seen here, will oversee the conservation of Jeff Bezos’ salvaged Apollo moon rocket engines. The historic NASA rocket engine parts raised off the ocean floor by Amazon founder Jeff Bezos have landed at a Kansas museum, where the 40-year-old artifacts' conservation will soon begin in view of the public. The Kansas Cosmosphere and Space Center announced Monday (March 25) the arrival of more than 25,000 pounds (11,340 kilograms) of Apollo-era F-1 engine components, which just four days earlier had arrived on shore in Cape Canaveral, Fla.
Now at the Cosmosphere's SpaceWorks, a 20,000 square-foot (1,860 square meters) facility, conservators, artisans, craftsmen and engineers will carefully separate the engine components of each recovered piece, some weighing over 2,000 pounds (907 kilograms), and continuously flush each piece in basins containing water and anti-corrosion agents to remove ocean debris and prevent further decay. The SpaceWorks' five-member team will be assisted by a conservator, maritime archeologist, and a partnership with aerospace engineers from the Wichita State University's National Institute for Aviation Research (NIAR). The Cosmosphere has also recruited former space shuttle astronaut Steven A. Hawley, now with the Department of Aerospace Engineering at the University of Kansas, and materials corrosion expert Carl Locke, the former dean of the University of Kansas School of Engineering. According to the Cosmosphere, the F-1 rocket engine recovery and conservation project will be one of the most complex efforts ever undertaken. The closest aerospace project of similar size, scope or complexity was SpaceWorks' 1999 restoration of Liberty Bell 7, astronaut Gus Grissom's sunken Mercury capsule, which was recovered through a Discovery Channel-funded expedition after sitting on the seafloor for nearly 38 years. SpaceWorks is perhaps best known for its restoration of Liberty Bell 7 and for Odyssey, the Apollo 13command module, both of which are now on public display in the Hall of Space at the Cosmosphere. Remar stressed however, that while both projects were aimed at restoration, the F-1 engine project now underway is considered a conservation mission. "In the case of both Apollo 13 and Liberty Bell 7, the goal of SpaceWorks was restoration — to reintegrate as many original parts as possible into the actual exhibit. Where original parts are not available, restoration allows you to fabricate similar-looking parts or to add new materials to replicate the artifact as it would have originally appeared," Remar explained. "A conservation project such as the F-1 engine recovery is very different," Remar said. "Here, our goal is to conserve the artifacts, preserve the integrity and original materials of the engines, and prevent any further damage from corrosion or age." "They will be cleaned and documented, and their engineering designs studied with modern scanners and technology," Remar added. "But the engines will not be rebuilt with new materials or replicated in any way." Despite Bezos having funded the location, recovery and now conservation of the F-1 engines, the artifacts remain the property of NASA. The work being conducted by the Smithsonian-affiliated Cosmosphere is being done with the space agency's knowledge. A public observation gallery will soon allow Cosmosphere visitors to see the conservation work in progress. Exhibits about the maritime recovery of these artifacts and others will be housed in the observation area. In addition, a new website is now under development that will allow the public to watch the progress live online. The public opening date for the observation area has not yet been determined, but is expected to be within the next month. Visitors will be able to purchase a viewing ticket at the Cosmosphere, and then will be shuttled to the nearby SpaceWorks facility. There will be no public entrance to SpaceWorks without a ticket from the Cosmosphere.